Baron de St. Omer, who was awarded the Manor of Molkebertuna after the Norman Conquest, in the 11th Century. 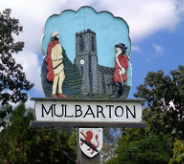 'Molkebertuna' is the name for Mulbarton given in the Domesday Book and means 'dairy farm on the hill'. The Parish Church features. a later member of the St. Omer family, Thomas de St. Omer, became Lord of the Manor of Mulbarton in the reign of Henry III. He claimed the privilege of Infangthef - i.e. the right to pass judgement for theft commited within the jurisdiction of his Manor. In 1285, he had Walter Godwyne of Carleton convicted of sheep-stealing and hanged on the gallows - but it was later proved that Walter should not have been hanged. Thomas is said to have rebuilt the Church as a penance for the wrongful hanging. Another relative, Ralph de St. Omer is the first name on the list of Rectors of Mulbarton - taking office in 1329. Sir Edwin Rich, Lord of the Manor of Mulbarton and Patron of the Church in the 17th Century. His family had been associated with Mulbarton since the time of Queen Elizabeth I, when his father (also Sir Edwin Rich) purchased the Manor of Mulbarton in the 42nd year of the Queen's reign. A monument on the south wall of Mulbarton Church commemorates this earlier Sir Edwin Rich who took part in an expedition to Cadiz in 1587 as a "gentleman volunteer" and was knighted by the Queen Elizabeth I. He married Honora and they had 4 sons and 3 daughters. The Edwin who features on the village sign was his second son. Sir Edwin jnr. is also commemorated in Mulbarton Church, on a plaque with some amusing verse that was surmounted by an hour-glass - now in need of repair. His own epitaph says, "Here lyes Sr. Edwin Rich who loved the poor" - and, true to his word, he bequeathed £105 to the poor of Mulbarton "to be distributed on the day of my burial there". He was buried in the church on 11th December 1675. £90 of this gift was invested in land, and the Rich's charity still benefits needy people in Mulbarton. The land is allotment land beside The Rosary, rents from which benefit the charity. Not all grants are made on 11th December, but many of them are made to help elderly people with their winter fuel bills! Sir Edwin also gave £200 to repair the road between Attleborough and Wymondham in 1685, and there is a pillar recording his generosity beside the old road. He also gets a mention in John Evelyn's Diary, as a relative of Evelyn's wife.